“Ghostland” is an upcoming horror movie directed by Pascal Laugier where someone’s dreams become a nightmarish reality. The movie trails the tragic fate of a mother and her two daughters after inheriting a house from a relative who died. Colleen and her daughters during their first night encounters murderers in their new home. Fighting to save her daughter’s lives, the girls suffer a terrible trauma night and their disparate personalities diverge even further. The eldest daughter, Beth, is said to become a famous horror author with a perfect family and life in Los Angeles, while her sister, Vera, can’t cope, and loses her mind faced to an unshakable sense of paranoia. Sixteen years later the daughters and mother reunite at the house where Colleen and Vera continue to reside. It is then that strange events begin to take place. French director and screenwriter Pascal Laugier, began his career with the two short films Tête de citrouille (1993) and 4ème sous-sol (2001). He kicked off his career in 2011 as assistant director of Christophe Gans’ period-fantasy-action film Brotherhood of the Wolf, where he also directed the ‘making-of’ documentary about the film.A die-hard fan of the horror movie genre, Laugier then directed Saint Ange (2004), the infamous cult movie Martyrs (2008), adored by the horror audience, and The Tall Man (2012), his first English speaking film starring Jessica Biel. “I am a huge movie fan, and I’m one of those filmmakers who can’t neglect their cultural baggage! My first film, ‘Saint Angel’ was completely referential and closed on itself, I filmed "the cinema that I loved" instead of actually making my own, but it was definitely a necessary step to make… I don’t deny any of it, but since then, I now try to approach projects from my own angle and personal experiences. Today, it is rather the comments of others around my films that makes me think of other references. If there is anyone that I took inspiration from in “Incident In A Ghost Land”, then I think Tobe Hooper’s spirit left a mark on me- watching his movies made me think of my beloved Lovecraft… on set! The iconoclastic and macabre madness dimension of his movies, especially in the very underrated ‘The texas chainsaw massacre 2’, undoubtedly gave me confidence in what I was doing. It reassured me by constantly reminding me that the greatest ‘honor’ of a horror movie is that of toeing the mark. When you have doubts about making films of such singular kind, the thought of making something ‘unacceptable’ or even ‘void’ can really help you move forward. So ‘“Incident In A Ghost Land” aka Ghostland is also the expression of the return of the repressed and perhaps of my ‘darkest side’ (laughs). Anyways, if you’re afraid of displeasing by doing horror movies, then you should do something else,” reveals the director on his inspiration on making horror films. 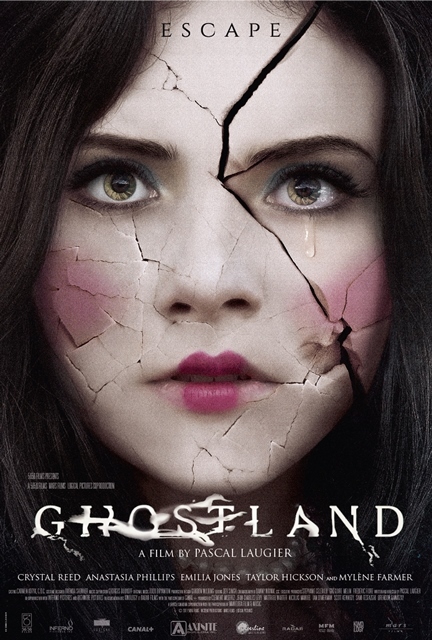 “Ghostland” opens March 31 (Black Saturday) in cinemas from Axinite Digicinema.